The deadline at midnight came and went. The negotiations continued into the night. But, at 5 a.m this morning, both sides called it quits and the pilots at Spirit Airlines, who are represented by the Air Line Pilots Association, left the negotiation table. And their cockpits. Spirit is not publicly traded. It is owned by Indigo Partners LLC and Oaktree Capital Management, LLC. The strike marks the first time in five years that an employee group has struck a U.S. airline. Ah, well, yes, I could see where that might be a problem. He also told the WSJ that the airline has purposely made sure all of its aircraft were back in the U.S. “where we want them to be” in anticipation of the job action. That’s what I love about this industry. It’s just so damn warm and fuzzy. Can’t you just feel the love? On a serious note — Spirit is not the most cash-flush operation in the world, and if the pilots are as successful in shutting the airline down as I suspect they are going to be, this could get very nasty, very quickly. Not to be a conspiracy theorist, but I’ve seen managements use a lot less motivation to justify shutting down an airline. And who knows? Maybe someone might like to snap up some of the airline’s assets for a decent price. I don’t say the pilots were not justified in what they did. It is their right to strike. And, in a weird way, it’s good to see the process still works. 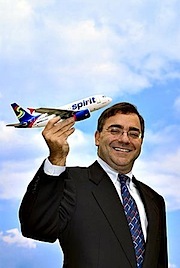 But on the flip side, Spirit is not a major carrier. There is going to be no urgency for the administration to create a PEB. And like I said, the airline is not sitting on a lot of cash, nor do the guys who own this thing feel inclined to throw any more cash at it. In addition, while the airline has posted a profit for the last three years, a big reason that has been the case is because of the rock-bottom labor rates at the airline. Should be an interesting weekend. Especially at the Ft. Lauderdale -Hollywood International Airport. Spirit handles 20% of the traffic out of there on a daily basis. This entry was posted in Breaking News, PlaneBriefs and tagged airline pilots, Airline strike, ALPA, Spirit airlines, strike on June 12, 2010 by Holly.